I really should know better than to visit some of the cute little gift shops in Ashland after the holidays. It's exceedingly dangerous wallet-wise. A week or so ago I had reserved an awesome hat kit from the Web-sters and it had come in on Tuesday. On my way up the plaza I had to pass FlowerTyme and just couldn't resist a peek inside. Needless to say, I came home with this fun thing. Right now I put it up in the kitchen but this is slated for the loom room. I have just the spot and will make a note to get a much nicer pic of it. 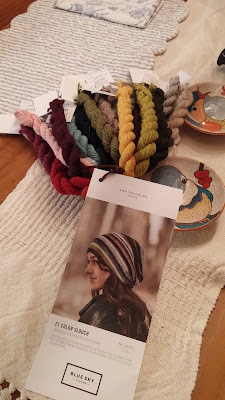 And here is the beautiful hat kit that started the whole thing! January used to usher in the big Fabric of Vision sale and I miss it, but while the purchases are not as large there are still some fun fabrics coming into the salon. Hedgies and dogs both in a lighter weight linen/cotton blend. Not much coming out this week. I started on something and then hated the pocket placement, removed them and now it is all waiting to be reattached before I can move on. Nick the Macomber though has seen some action. 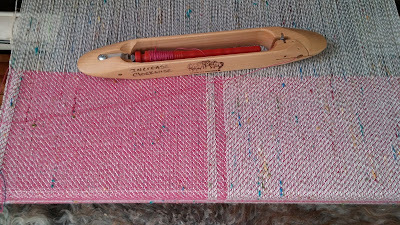 The blue linen towel has been complete and a dark pink one started. 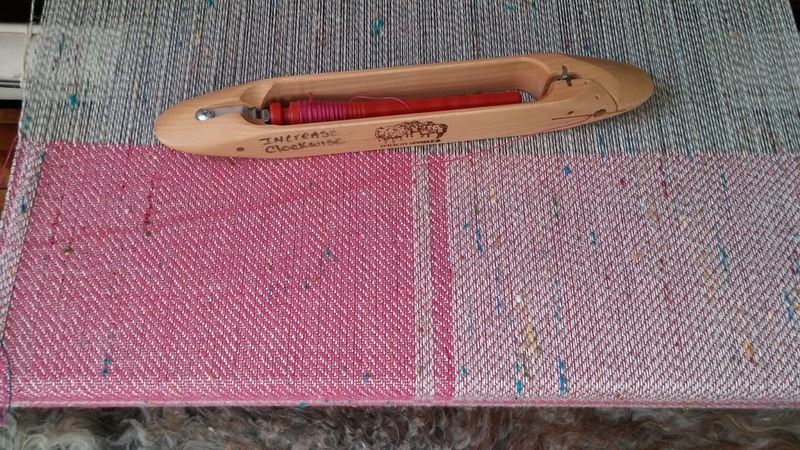 This is Louet linen color way "Crabapple" and quite pretty it is! The give-away items all left here Wednesday. Enjoy everyone! for my Mom, who won't use a computer and is easily daunted by the newer electronics. Her ancient Motorola flip phone was on its last legs. She wanted a monthly bill, set price. It is hard to find simple phones but we did (a flip one! 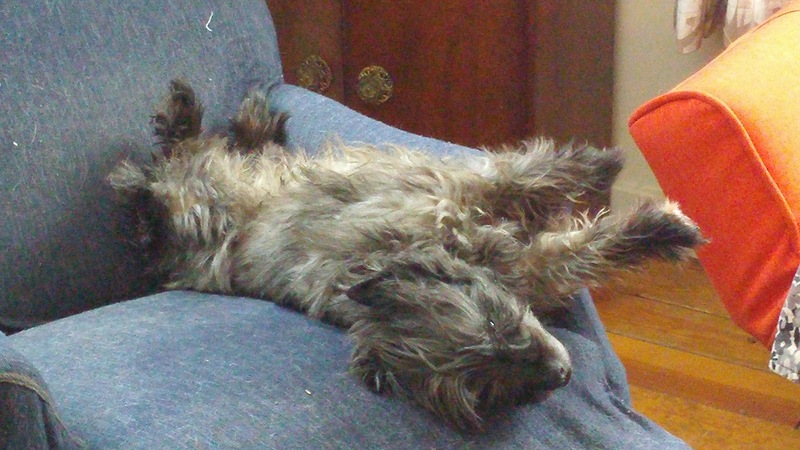 ), and it was easier and cheaper to add her to our plan. Rather than have her pay us every month (how silly) we agreed a dinner out at least once a month all together. We drive, she buys. Win,win. She gets out someplace different, and we have a date all can look forward to. Gene often misses our lunch after shopping or quick breakfasts out. Holy crap batman, it's like someone turned on a fire hose with a steady stream of something bad this week. It's hard to pick. There is so much. Gag orders, Mexico, ACA, real facts going missing and being replaced with those alternative facts. I'm flooded, or should I say .... swamped! Words do matter. An excellent op-ed piece by Eugene Robinson. Six journalists charged with felony rioting for covering the rioting during the inauguration. Black sites and torture making a comeback for the USA. And Trumps calls for taking the oil have certainly put our troops in harms way working in unstable oil producing countries like Iraq. But the one that has me freaking out is the A block piece by Rachel Maddow last night, coupled with the news that Comrade Tillerson will be appointed, career officers in the State Department being let go with no replacements and the call to Putin on Saturday. Buffalo Springfield had it right, there's something happening here. Parting shot: Chillin on a Sunday Afternoon. Where did you get that heggie fabric? On trump - it just gets scarier and scarier by the day doesn't it? I highly doubt all those republicans agree with all of it - they need to get some balls and stand up to him. You may want to check out and/or join this website. I need to take action, and this is a directed way to do it. Gotta get myself some pink yarn/fleece and make a hat! Oh yeah, and I'm making an additional contribution to Planned Parenthood for my yarn. I'm lovin' that hedgehog piece!!! Way too cute! I have gotten to where I hate to turn on the news anymore. I think we are going to see plenty more protest marches!!!! Love the clock! And what a great arrangement with your mom. That's creative bartering at its finest. 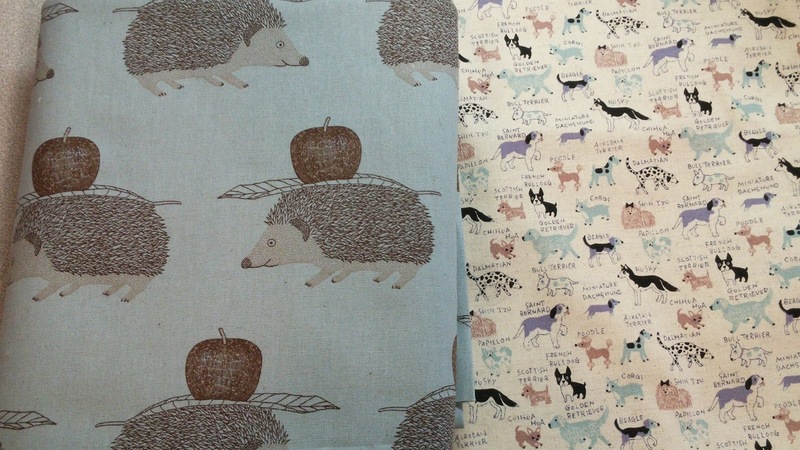 Love the hedgehogs and the little dog fabrics, you always pick the cutest fabrics. I want to come and visit your fabric stash! 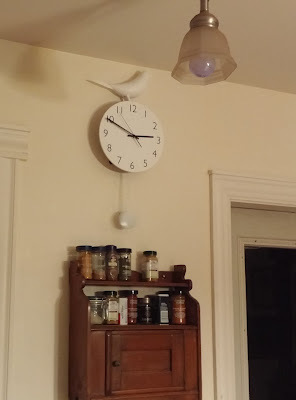 The new bird clock is just perfect - love it. My yarn arrived yesterday, just moments after I did the online donation to PP. OMG it is STUNNING!!! THANK YOU sweet lady! My yarn arrived yesterday, too; LOVE the color! Thank-you so much! Michelle and Peg, You are most welcome. Enjoy your yarns! Martha, if you ever got over here, you could certainly spend time with the stash. I even have a few extra sewing machines hanging around, and dogs! 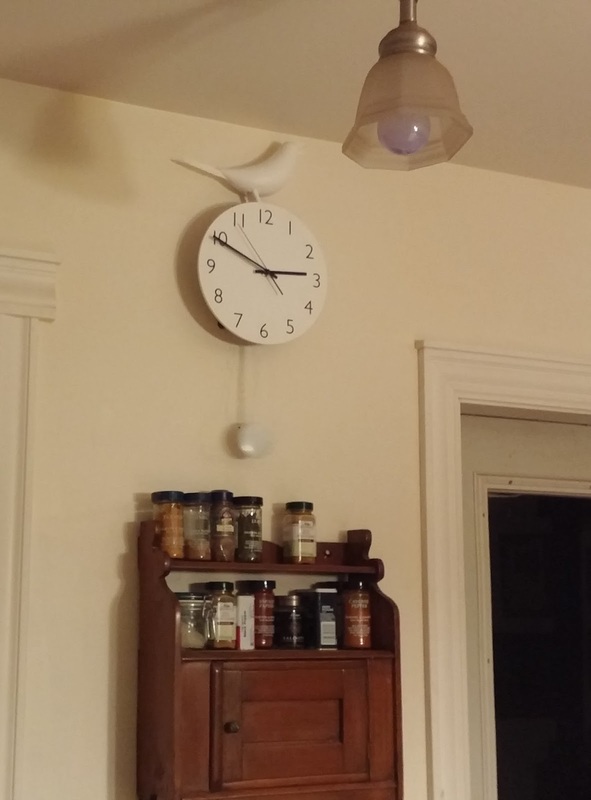 Leigh, I love that clock too, a modern cuckoo clock maybe without the noise. Michelle, What a nightmare has hit Saturday huh? LA, I'm petting that hedge piece for a while. It's almost too cute to cut..almost. Peg, I did join that site. Thank you. Cindie, Trump is a trainwreck...Sad! I received the circular needle case, thank you so very much. My needles are safely tucked away.